I debated not posting this until these pillows got to the post office, but I just can't wait. Don't ever put me in charge of your surprise birthday party. I'd never pull it off. Then again, I suppose if you put me in charge then you'd already know about it anyway and we'd be all good. For those of you who don't follow Kacey at Chronicles of a Mommy (the new owner of these pillows), first, go check out her blog. Now is fine. It's okay, I'll still be here when you get back. See what I mean? Fabulous. I think these pillows will fit in just swimmingly! 1. I transferred the image to my black linen fabric by coloring the back of the image in chalk, putting it on top of my fabric, and then tracing it. Then, I went over the chalk outlines with a white colored pencil to make sure they'd stay. All this would have been easier if I'd had white transfer paper, but "necessity is the mother of invention" right? 3. I cut out the flowers and leaves leaving a wide (inch or so) margin around them. 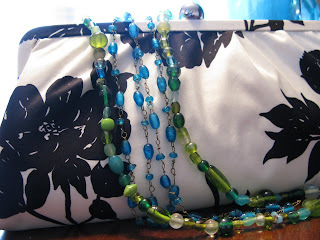 "Be sure to cut out a reverse image of your pattern on the freezer paper. 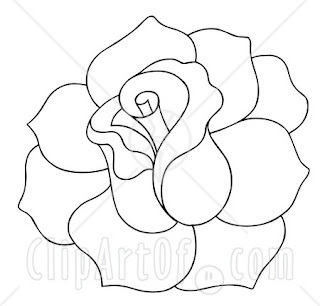 Remember the shiny side has to adhere to the back of your rose,"
6. With all the black pieces sewn down to the top now, I cut out one square of white fabric the same size as the pillow top, one of black fabric, and one square of batting. 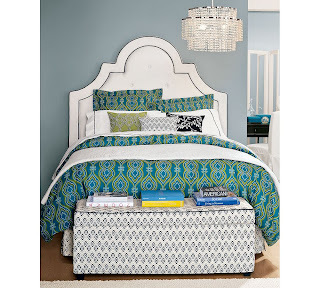 I sandwiched the batting between the pillow top and the square of white fabric and pinned. 7. 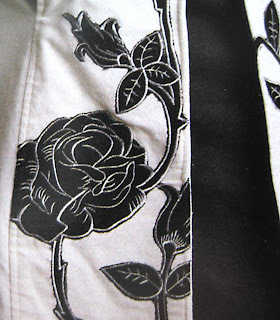 To create the wavy machine quilting lines between the roses, I took the now pinned top and batting and placed it in an embroidery hoop, which is tricky with all the bulk. Then I set my machine stitch length really small and put the part of the top secured inside the hoop under the pressure foot and started sewing. I then did something I was always told not to do in normal sewing and FORCED the fabric under the needle in a wavy pattern rather than letting the feed dogs pull it through. The hoop acts kind of like a steering wheel letting you easily movie the fabric around. I tried it without one first, and it worked, but it was decidedly more difficult. The faster I moved my hoop the larger my stitches were, the slower I moved it, the slower the stitches. 8. Finally, I sewed the black square back of the pillow to the front leaving a small space to put the stuffing in, turned it inside out, stuffed it, and then sewed the hole closed. 2. 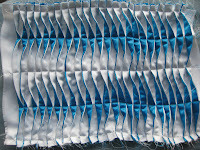 Fold and press along the left side of each blue strip. 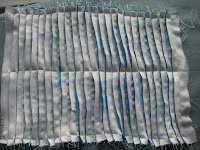 On each fold, stitch in the seam along the right hand side of each blue strip to form flaps/folds as seen above. At this point, my pictures become slightly less useful because they are all a different direction from the ones above, and they don't have a wide 2" strip at the end. I realized while making mine that I'd need one next time. I learn as I go. Thank goodness for the contrasting colors to help make the instructions clear in the end. 3. Press all flaps down to one side so that only the white sides are showing. Stitch with the white thread along the top and bottom about 1/2" from the edge. 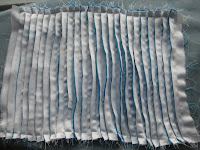 Then stitch directly down the middle. 4. Re-thread your machine with the blue thread. 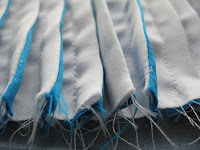 In each of the two sections created by the previous stitching, fold the flaps the opposite direction so that the blue side is showing. You may have to pin the flaps in place. Stitch down the center of each section. 5. 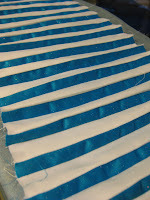 Cut out a piece of either blue or white fabric the same size as the top. Sew it to the top with right sides together leaving a small gap for stuffing. 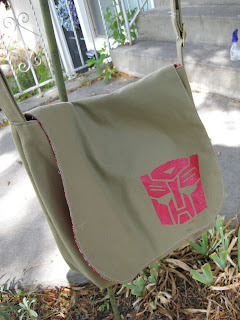 Turn it inside out, stuff it, and sew the hole closed. One of the things I really like about this pillow is that it changes depending on the angle at which you are viewing it. Can I just say once more that your creativity amazes me!!! I'm so impressed! You should be SO HAPPY that I do not have your phone number because I would be screaming with joy in your ear right now!!!!!!! SHUT UP! You have TOTALLY outdone yourself and I am ever SO grateful. I CANNOT believe your handy work and how you turned points of inspiration into absolute perfection. I'm SO excited! Did ou get my email I sent you a week or so ago? I need your address again my dear. :D I'll forgive you for not replying since it looks like you've been pretty busy. WOOOOHOOOO!!!!!! you are very talented, and a sweet friend! I came running when I saw these pillows on Kacey's blog! 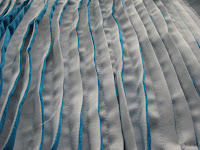 I am making the wave pillow as soon as I make it to a fabric store! Thanks for the tutorial! I came over from Kacey's blog. Great job!